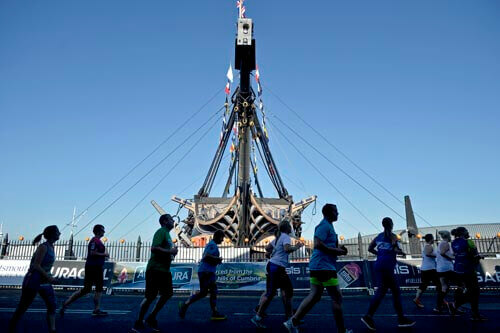 This year the Simplyhealth Great South Run celebrates 30 years, with thousands of people taking on a 10 mile (16 kilometre) course through the streets of Portsmouth, passing landmarks such as HMS Victory and the Spinnaker Tower. The course is almost flat, with minimal slopes around the course, helping make fast times achievable. The Simplyhealth Great South Run will be held in Portsmouth on Sunday 20th October 2019 and the 5k, Junior and Mini events will be held the day before on Saturday 19th October. Entry for all events is now open, follow this link to register for the Great South Run 2019. The event has grown from humble beginnings in 1990, with 2,000 runners to over 20,000 people taking part in the world's leading 10-mile run in Portsmouth, raising millions of pounds for charity. Runners take in the sights of the iconic Spinnaker Tower, passing through the Portsmouth Historic Dockyard with the iconic HMS Warrior and HMS Victory in view, before crossing the finish line on the sea front, overlooking the Solent. Over the last 30 years, up to 400,000 people have crossed the finish line of the Simplyhealth Great South Run and the event has now grown into a packed weekend of sport, which also includes the Simplyhealth Great South 5k and the Simplyhealth Junior and Mini Great South Run. Along with the thousands of fun runners, club athletes and charity teams, will be a mix of celebrities and elite athletes. In 2009, Team GB favourite Mo Farah won the Great South Run in a time of 46 mins and 26 secs, the first British runner to win the race since Gary Staines secured his third win in 1996, Mo praised the Portsmouth crowd saying "The crowd made a big difference - they kept cheering me". British ladies have also excelled with wins in previous Great South Runs, Liz McColgan (1995 & 1997), Marian Sutton (1998), Jo Pavey (2006 & 2012) and Paula Radcliffe (2008) have all taken 1st place in the race, which is classed as a Gold Label Road Race by the International Association of Athletics Federations (IAAF). But it is not all about the elite runners, every year thousands of fun runners, joggers, locals, celebrities and charity runners take part in the race, raising £millions for their chosen good causes. It is estimated that more than £35 million has been raised for charities by runners in the Great South Run, since its start in 1990. In fact if you have not been able to secure a place, a guaranteed charity place is a good option, see links below. 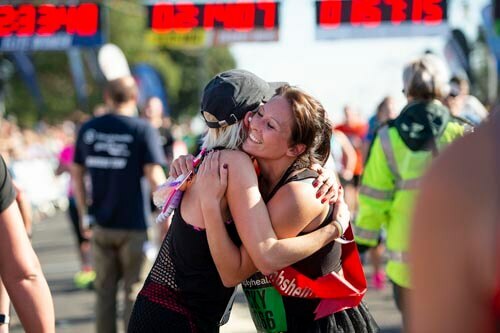 GREAT SOUTH RUN - GUARANTEED CHARITY PLACES. Guaranteed charity place are a great way to get an entry to the Simplyhealth Great South Run and at the same time helping to raise much needed funds for the charity. For details of charity running places please visit our Great South Run charity places page. Parking spaces will be available on Southsea Common itself, follow the Great South Run road signs, or you could use one of the many city centre car parks follow the link for more details. Follow this link to view a map indicating the location of car parks in Portsmouth. The roads adjacent to the start and finish on Southsea Common will be closed from 06:30am.This includes Pier Road, Clarence Esplanade and Avenue de Caen. All other roads on which the race will be run will be closed from 09:45am. Roads are re-opened as soon as possible on a rolling basis but all roads will be re-opened by 14:00. If you arrive late use the city centre car parks and walk to the race start area. As Portsmouth is an island there are only three access roads, so there is bound to be some congestion after the race, so why not stay a little longer and visit one of the numerous pubs or restaurants in Portsmouth, after all you will have earned it. If you are planning to stay overnight or maybe make a weekend of it there are plenty of Hotels to choose from, but book early as it is bound to be a busy period, follow this link Portsmouth Hotels for more information. The course map below is interactive, there is information on points of interest along the route, click on the marker to see the details.